“Your Preferred 4-Star Business Class City Hotel in Kuala Lumpur”. Opened in 2005, the hotel is centrally connected amidst Kuala Lumpur’s most exciting entertainment and shopping area and significant business district, boasting 519 modern and well-furnished guest rooms including the business-centric club rooms and suites are exclusively situated at the new Club Tower. Guests may opt to choose from elegantly designed Superior, Deluxe rooms or Executive Suites ranging from 30sqm to 60sqm in sizes. The Club Tower guests enjoy the complimentary usage of the Club Lounge. All rooms have a pillow menu to cater to the comfort of our guests’ sleeping needs along with the other expected amenities. Its renowned food and beverage outlets feature a variety of culinary delights. 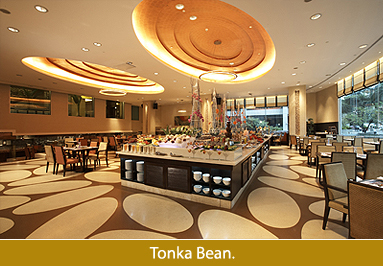 Tonka Bean Café features authentic local and international delights in a cosy stylish atmosphere with a sitting capacity of 280 persons. 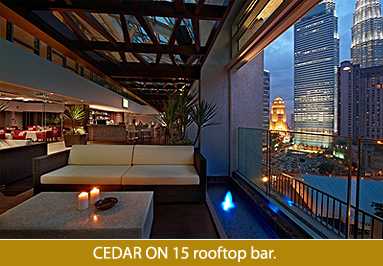 The rooftop open-air outlet; Cedar On 15 is one of KL’s popular outlets that offers the best view and drinks and is available for private events for up to 250 persons. Oswego Bar is designed for a relaxing and cosy evening while the Lobby Lounge provides our guests with a casual meeting place entertained by the soothing tunes of our in-house musicians.